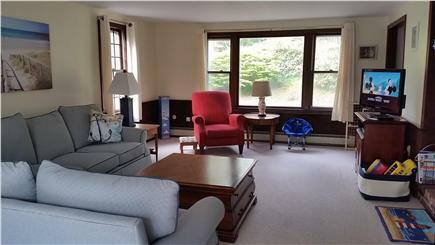 Chatham vacation rental ID 24671 has fresh paint in most rooms! Beautiful Jackknife Beach is just a 1/2 mile away. The spacious living area is perfect for relaxing. The open living and eating areas are perfect for a crowd. The freshly painted kitchen houses many amenities. The main bathroom has a bathtub. 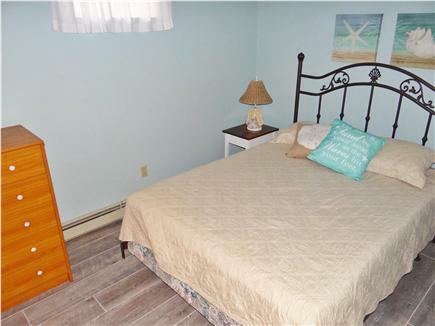 The master bedroom is centrally located and has a queen bed. 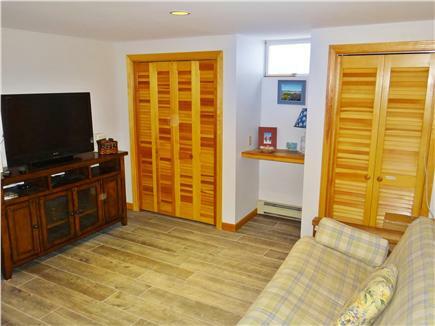 Downstairs has brand new flooring, a fireplace, futon and TV. The freshly painted downstairs bedroom has a queen bed. Bedroom 3 has 2 twin beds that can be converted to a king. Bedroom 3 has room to sleep and play. Bedroom 4 has plenty of room with 2 twin beds & a sitting area. Cook on the new gas grill and enjoy outdoor eating. There is a large deck and one year old outdoor shower. Lodging Tax Buster!!!! New Reduced Rates for Summer 2019. Save $250 over last year. This home features a/c for those hot summer days. 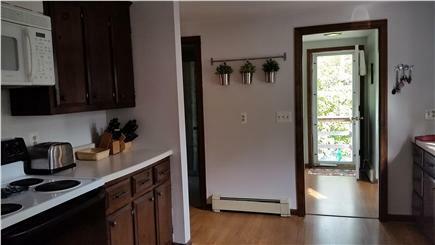 There are many comforts including a dishwasher and washer and dryer on the main floor, 3 TV's, and Internet. Also provided are a coffee and iced tea maker, microwave, beach chairs, umbrellas and baby gates. 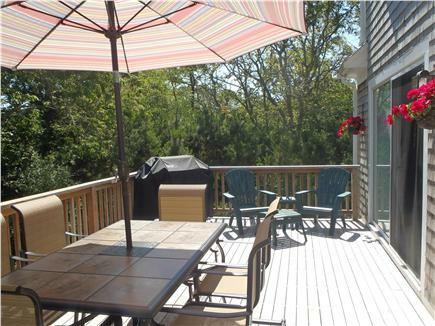 There is a large deck overlooking the back yard, complete with a newer gas grill. The main floor living and dining areas are open and quite spacious. 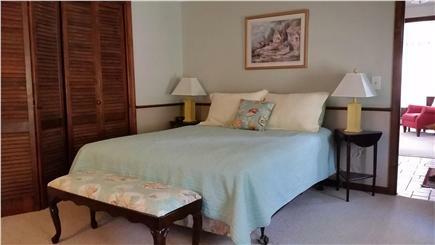 The master bedroom houses a queen bed and is centrally located, with a full bathroom just outside the bedroom door. Upstairs, two large bedrooms each contain two twin beds. Bedroom number #2 has a sitting area with a TV and bedroom #3 has a table that is perfect for playing board games. In between the 2 bedrooms is a full bathroom with a stall shower. The lower level has bedroom #4 with 1 queen bed, a sitting room (with a futon and tv) and a full bathroom. A spacious outdoor shower with changing area, built in 2014, is the perfect end to a wonderful beach day. You only need to pack your clothes, food and linens! Chatham Dream is ideal for simply relaxing or for entertaining friends and family! Thanks, Susan! Glad you had a great time!!!!! We really enjoyed our stay at this lovely home. It was spacious, tastefully decorated, well-stocked with everything we needed. Well air-conditioned. Very quiet street, nice deck for relaxing or grilling dinner. 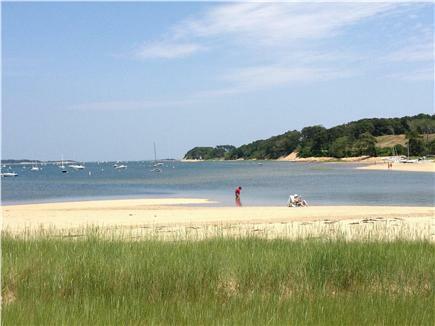 Short drive to the town of Chatham and lighthouse, shopping, and several area beaches. The hosts were very fast to respond to any questions we had. Perfect vacation for our large extended family! Thank you for the kind words! So happy you had a great time! Hope to hear from you again next year. Very reasonable price for this very well equipped vacation home. Besides needing to bring linens and towels, this home had everything you might need. We had a party of 10 and there was plenty of room. Beautiful, large dining room table that seated us all for a couple of family dinners. Would recommend this property without hesitation. Thoroughly enjoyed our vacation....will definitely rent this lovely home again! We had a very relaxing vacation in this cozy home with lots of charm. The many, multi-color rhododendrons were in bloom and were gorgeous...the largest bushes I have ever seen! We loved eating on the spacious deck. Home is much larger than we thought it would be, with 3 levels...plenty of space for everyone! My husband and I took bedroom 3, as we had requested the two twins be converted to a king. We both agreed the bed was extremely comfortable and the bedroom was very roomy. />Maryann and Paul were great to work with. They made sure we had everything we needed and recommended some of their favorite places to eat and suggested a few beaches to visit since this was our first visit to Cape Cod. The kitchen was stocked with everything we needed for the meals we cooked. The house was clean and nicely decorated. We look forward to returning to this lovely home next summer! Paul grew up vacationing at the Cape each summer with his extended family. 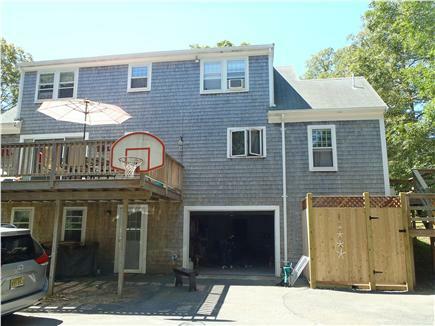 Prior to purchasing our Chatham Dream in 2014, we rented on the Cape for many years in Harwich. We have always loved the charm of Chatham. Being renters, and traveling from New Jersey, we always hated having to pack beach chairs and often having to buy paper goods and cleaning supplies. We have tried to make your stay at our home both pleasant and convenient, therefore we provide everything we have thought of, excluding linens and food. We love the Cape and hope you do too!! Chatham Dream is a home where we go to relax!! It is spacious and uncluttered. The raised deck makes it feel like you are up in the trees - and closer to the stars at night. The outdoor shower is our favorite amenity! The convenience of the laundry room right off the kitchen might seem like a small thing but we stayed in many rentals where we had to go outside to enter the basement to do laundry. There is plenty of room for large families. We provide games and puzzles as well as outdoor games and beach toys. Since purchasing our home, we have discovered the convenience of the location of Chatham. 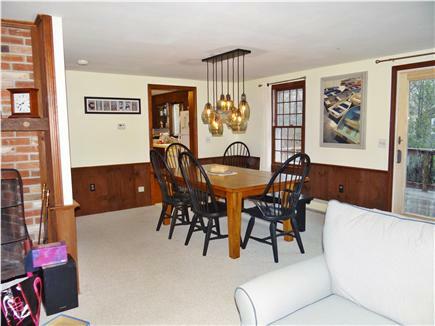 The central location provides easy access to Hyannis and Provincetown and everywhere in between. The Harwich ferry to Nantucket is less than 10 minutes away. Although our home is not really walkable to beaches (Jacknife is close but roads are busy and there are no sidewalks), we like to spend our time at various beaches on the ocean, bay or sound and at the nearby ponds. Each has something unique to offer and all are just a short drive away. For this reason, we think the location of our home is a great one. We believe Chatham is the most beautiful town on the Cape! The downtown area is picturesque and houses a variety of restaurants and small shops. The Fish Pier is a great viewing area for seals. We have discovered Monomoy Wildlife Refuge. The view a the long walk along the beach at low tide are just wonderful. Chatham now has Mondays on Main, a fun family time. The age old tradition of Friday night band concerts in the park continues, with music from Chatham's own band. The Chatham A's baseball games are free and fun! Games run through the first week of August. Take a seal cruise and see Chatham from a different view. Walking is a great way to see downtown Chatham. You will pass Lighthouse Beach and the lighthouse, beautiful old homes, the Old Mill, a beautiful new bridge over the river, Oyster Pond and of course the shops. We continue to discover more of Chatham each year!